The objective of the workshop is to provide basic understanding of the React Native framework and the React designs principles by building a Native App for iOS and Android platform. For a smoother and faster start of the workshop, please make sure you have your env setup and a running React Native App by following the sections below. Setup your machine by following the instructions available at official React Native getting started link. Click on Building Projects with Native Code tab, select your Operating System and desired target platform(s), then follow the setup instructions. VSCode is the IDE that will be used during the course. Unless you have strong preferences on other IDEs it is suggested to have it installed before the start of the Workshop. You can download and install VSCode from here. Create an application with the command react-native init MyMovies and run it via react-native run-ios and/or react-native run-android as per the getting started guide. In case of issues consult the troubleshoot section of the guide or refer to StackOverflow with the encountered issue. Please note that Java 8 is the actual supported Java version for Android. If you have already upgraded to Java 9 you can either downgrade or keep both, but carefully setup the env to only use Java 8 for Android builds. You may get confused between react-native init and create-react-native init . The first is the usual way you create a react native project with native dependencies and that's the approach used during the Workshop. The latter is a simplified setup which allows running iOS and Android react native without the need of Xcode or Android Studio to actually compile your app. Both are valid approaches and please note from the latter you can eject to the former. Still, the Workshop will just cover the react-native init setup. Julian Fahrer, Software Engineer, Hover, Inc.
Julian is a Software Engineer, Online Educator, and Container Enthusiast. He automates all the things and containerizes Ruby applications at day. At night he sleeps. In between those times, he is busy climbing, hiking and teaching people about Docker and Containers at LearnDocker.online. His current life goal is to drastically reduce the time he sits per day. Learn from industry-leading Cloud Strategist Jeffrey Deverter how to modernize your applications using continuous deployment and continuous integration on the Cloud. Jeffrey will discuss a methodology that will enable you to modernize applications to reap several business benefits - including Agile improvements, transparency into the true cost of ownership of application operation - and share advice on how to drive business value and the direction of applications. Behavior Driven Development (BDD) has many benefits, including quicker development cycles, increased automation, better collaboration between departments and reduced siloed communication. But for all the benefits, organizations are still hesitant to transition to BDD because of the changes on their people, processes and tools. In this webinar, we’ll explain a successful framework for evaluating your readiness for BDD, considering your potential roadblocks and making a seamless transition. The year 2020 is approaching faster that you imagined. And the paradigm is shifting rapidly, with go, no go decisions being made in seconds and the battle for customer loyalty becoming an everyday reality. As companies across the board are moving towards DevOps and a shift-left approach, defining clear goals and making the right decisions, right now, is critical to success. The enterprises that most espouse shared responsibility, empowered autonomous teams, and continuous learning environment allow DevOps to thrive in their organization, in the truest sense. Join Zephyr Product Manager, Ankita Bhargava as she covers the four critical components to test management in a DevOps ecosystem and why it is integral to achieving continuous software delivery. Presenter Bio: Ankita Bhargava brings over 7 years of product, engineering, and networking technology experience. Prior to Zephyr, Ankita has worked in product and marketing roles in companies such as Godrej, Aadtech and Loadstar. She holds an MBA in Product Management & Marketing and a Bachelor’s degree in Computer Science. Outside of work, Ankita enjoys playing tennis, scuba diving, hiking and travelling and experiencing new cultures. Join Seth Vargo and Liz Fong-Jones, Developer Advocates at Google Cloud Platform, to discuss SRE vs. DevOps. Two trending disciplines with a fair bit of overlap, Seth and Liz share their insights on how the two communities can work together and build better, more reliable systems. Tune-in, join the discussion and don't miss your chance to ask any questions you have to two leaders in the field. Join us as we build a complete streaming application with KSQL. There will be plenty of hands-on action, plus a description of our thought process and design choices along the way. Look out for advice on best practices and handy tips and tricks as we go. This is part 2 out of 3 in the Empowering Streams through KSQL series. BrightTALK Coding Academy is a free online educational resource for beginner and professional coders. 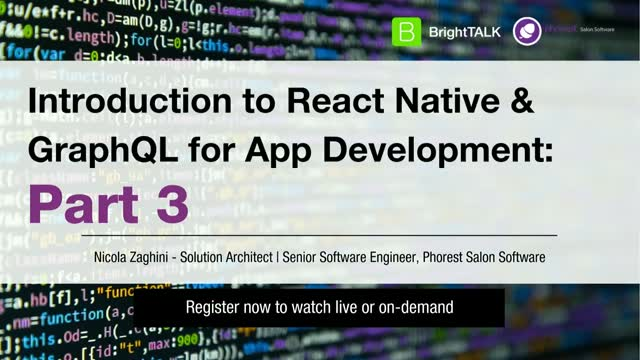 Whether you're an established developer, or thinking about entering software development and want to learn the basics, BrightTALK Coding Academy links you to leading tutors and experts for live and on-demand sessions. Covering all languages, frameworks and platforms, BrightTALK Coding Academy is here to help you learn and grow. You can now save presentations to a watch later list and revisit them at your convenience. Click on your profile menu to find your watch later list. Hi, I thought this webinar was interesting and I wanted to share it with you. You are confirmed to attend for free on BrightTALK!